So, Mother's Day is in a week and if you're looking for an easy, yet impressive, Mother's Day gift to surprise the mother of your children, or the grandmothers, or if you want to get your kids to make YOU something, here's what I made with the kids last year. Chalkboard Paint. I found these colourful paints at DollarTime last year. Step 1: Paint the pots. While Chalkboard paint dries very quickly, it's a good idea to do this at least one day before. You may need a couple coats. If you don't like the bright pots, go for one colour, or even black. After the pots and the bases are dry, it's time to write on them. Step 2. I found great chalk crayons at the Dollar Store; the colour adheres, unlike traditional chalk, and they write like a wax crayon. You can even get them in different colours. Coloured Sharpies could work here, too. You'll want to write on the pots before there's soil in them -- makes it easier to tilt. Of course, if your child can print, this is the best part of this craft. 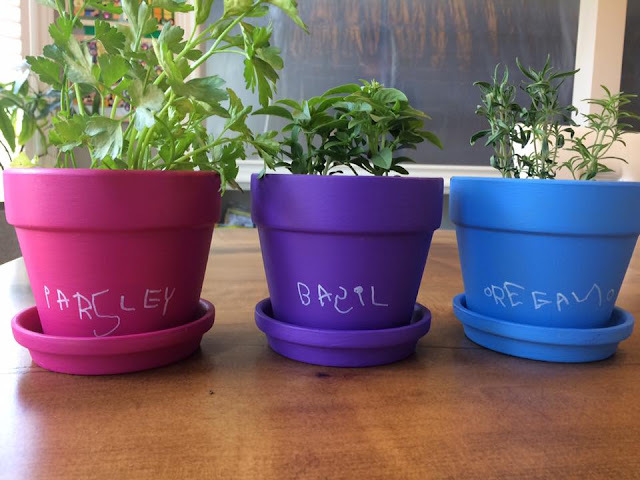 I love seeing Isabelle's little letters on the pots. Even if some are backwards! Once the pots are labelled, fill with a potting soil, or vegetable soil. Decide if you'd like to fill the pots with herbs or flowers. I went with herbs, and customized the trio depending on the mom. My mom likes oregano, while my mother-in-law likes thyme. Water them, put them in the sun and most of all, keep them alive until Mother's Day! My mom had her set on the deck all summer long and used the herbs for most of the season!